Worms W.M.D launches on Nintendo Switch next week! Today at Team17 we are very excited to reveal that Worms W.M.D will officially be launching onto Nintendo Switch on 23rd November! Rocking a high rez, hand-drawn 2D look, over 80+ weapons including classics and new additions, crafting, vehicles and usable buildings, Worms W.M.D really is the best worms experience to date and rightfully takes the crown as the spiritual successor to Worms Armageddon – did we mention it also has HD Rumble and is playable anywhere! 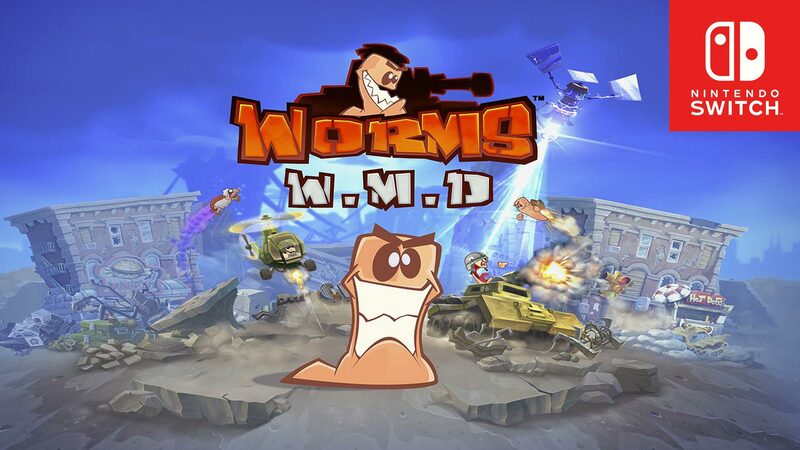 Now we know worms is all about multiplayer and we are proud to share with you that Worms W.M.D on Nintendo Switch fully supports local multiplayer with your friends on one Nintendo Switch or multiple Nintendo Switch consoles wirelessly. You can even take advantage of a variety of different controller options, with up to four players using a mixture of individual Joy-Con controllers or the Pro Controller. For those who want to extend the fun to six-player battles you can just play pass the controller, hot seat style, with as little as just one Joy-Con! But wait, there’s more – Full online multiplayer support, heaps of single player content including a story mode, challenge missions, training, the Liberation expansion DLC, Forts Mode and bonus content from the All-Stars pack which features guest stars from our friends including Rocket League, Goat Simulator, The Escapists, Yooka-Laylee and more! Worms W.M.D will be available to download for Nintendo Switch via the Nintendo eShop for £19.99 / 29,99€ / $29.99 on the 23rd November. COMPETITION: Name an allied creature in Sword Legacy: Omen!